The thin bony fingers of death penetrate our lives. People we know and love face this villain. We try to avoid thinking about our own inevitable meeting with this fearful foe. But when we come right down to it: What is it? Where did it come from? Is it the end of all things or the passage from one world to another? Is there more than one kind? Whether we like it or not, we need to know these answers before our final appointment with dying. Has death always been with us? No, this dark shadow is not natural. It has been with us for so long that it seems to be natural, but really it is an unnatural and violent interruption of life. Termination of Life was not part of the original creation. "Then God saw everything that He had made, and indeed it was very good..." [Gen. 1:31, NKJV]. Everything God made was good. Nothing God created could die. Obviously that is not the way things are now. So what happened between then and now? "And the Lord God commanded the man, saying, 'Of every tree of the garden you may freely eat; but of the tree of the knowledge of good and evil you shall not eat, for in the day that you eat of it you shall surely die" [Gen. 2:16-17, NKJV]. The tree of the knowledge of good and evil wasn't some magical tree, any tree would have done. The reason for the tree was that God didn't want robots. In order to have people who would love and obey Him freely, the people had to have the choice not to obey. The tree represented the choice: to love God or to reject Him. As Adam was the representative of the human race he brought sin and the ending of life on the entire creation when he disobeyed. "Therefore, just as through one man sin entered the world, and death through sin, and thus death spread to all men, because all sinned..." [Rom. 5:12, NKJV]. Now we know how and why this villain entered God's perfect world. It was through the sin of rebellion [treason] - man's rejection of the loving God. God told Adam that he would die the day he disobeyed and yet Adam lived for 900+ years after his disobedience. Why? Adam and Eve deserved the penalty of treason that very day in the Garden of Eden [and in one way they did end their life]; however, God delayed terminating their physical life because He, in mercy, looked forward to the day Jesus would be crucified for their sin. OK, so this villain penetrated into God's perfect world, corrupting everything in its path, because of Adam's sin. You still haven't answered the question of what it is. 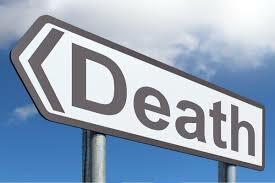 The Biblical concept of death can be summed up in one word - separation. In that context there are three different kinds and we will examine each one. Physical death is the type which usually comes to mind. It is the unnatural separation of a person's soul and spirit from their physical body. Death NEVER means non-existence. From the moment a person is conceived in his mother's womb, he will exist forever. "Do not marvel at this for the hour is coming in which all who are in the graves will hear His voice and come forth - those who have done good, to the resurrection of life, and those who have done evil, to the resurrection of condemnation." [John 5:28-29, NKJV] This shows that ALL are going to stand before God. This also shows that one day we will be re-united with our bodies. What happens when our physical life ends? The answer to that question depends on a person's relationship with Jesus Christ. In either case the body, which is only the shell we live in, goes into the grave and the real us [spirit/soul] goes somewhere else. For the non-Christian, the end of life on this planet is the entrance into a realm of inescapable, eternal terror. It is described as a place of "everlasting fire" [Matt. 18:8] and "outer darkness" [Matt. 22:13] where there will be "weeping and gnashing of teeth" [Matt. 22:13]. But even those are only symbols because it is impossible to describe the awfulness of hell. All the pain and suffering in the world today is only a small picture of what the non-Christian is facing on the other side of the dark door. While it is a small digression from our topic we should take a moment to point out that while we ALL deserve to go to hell, because of Jesus, NO ONE has to go to hell. However, ALL who refuse to come to Jesus as Saviour and Lord WILL end up there. This brings us to the second kind of ending of life: spiritual death. This is the unnatural separation of a person from God. In our basic design we were made to live our life in a loving relationship with Almighty God. It was His Love, His Wisdom, and His Power which was to see us fulfill our mandate of managing the earth. Without that vital relationship nothing in our personal lives or the world as a whole will function correctly. God is Life itself. Without an intimate relationship with Him, our lives are pale shadows of what they could/should be. We are filled with frustration, fear, and a sense of unfulfillment. In a very real way, we are the 'living dead' outside of Jesus. This makes the spiritual form of this enemy by far worse than the end of physical life for it ruins our current lives and is the root cause of the end of our physical life. Everyone who has lived on this planet [with three exceptions: Adam, Eve, and Jesus] is born spiritually dead. We were designed to have intimate fellowship with God and yet when we are born, because of sin, we are born with that vital part of our life non-operational. The third kind form of this villain is Eternal Death. It is what happens to all those who have rejected Jesus as Lord and Saviour when Jesus returns to earth in the Final Judgment. It is Spiritual Death taken to its final degree. It is forever, without hope, being cut off from God. It is eternal Hell. Is there a solution to this problem? Can this villain be defeated? Do we have to put up with it? Except for the people alive when Jesus physically returns, we will all face the physical end of life. There is no way to avoid it. But the end of physical life does not have to bring us permanent harm. We can come out on the other side laughing in victory over death. In order to escape the fear and eternal harm of the physical end of life and the permanent terrors of eternal Hell, we must defeat spiritual death NOW - while we are still physically living. The only way to defeat this spiritual life-killer is through a right, loving, and growing relationship with Jesus Christ. We can NEVER defeat the spiritual end of life on our own. All the religions of the world are man's attempts to evade God and to defeat this spiritual blackness on their own terms. They all fail. Only God can breathe life into us. The relationship has to originate with God. The good news of true Christianity is that God has done just that! He became a Man in the Person of Jesus Christ and defeated sin, which is the root cause of all ending of life. When we accept what Jesus did, and submit ourselves to His total Lordship, then His victory over his black-hearted monster becomes our victory. 1. We need to believe God loves us - that is why He paid the supreme price for our lives. 2. We need to recognize that we are born sinners - spiritually separated from God. It is that sin which divides us from God. Whenw e recognize our sinful rebellious behaviour we need to repent - to tell Jesus we are sorry and will turn - with His help - from our wicked ways. 3. God has done everything necessary for us to enter a dynamic love relationship with Him - one of the results of which is the defeat of this spiritual gripping darkness which binds us. There is nothing we can do to earn this relationship, we simply fall into the arms of Jesus. 4. Ask Jesus to come into your life, forgiving you for being a sinner, and placing yourself under His complete Lordship. Here is a sample prayer you may wish to use: "Jesus, thank You that You love me so much that You came to die for me. I know I am a sinner and I have offended Your perfect holiness. Please forgive me. Come into my heart, wash away my sins, and make me Yours. I believe in You and that You rose from the dead to be my Saviour. I commit my life into your hands. Thank You for saving me and making me Yours forever". When you do this, this spiritual villain is defeated in your life. You have entered into a new, wonderful life. You will never face eternal death, and the physical end of life is only an entrance into a better existence. If you need more information or have any questions contact a nearby, Bible-believing church or contact me. 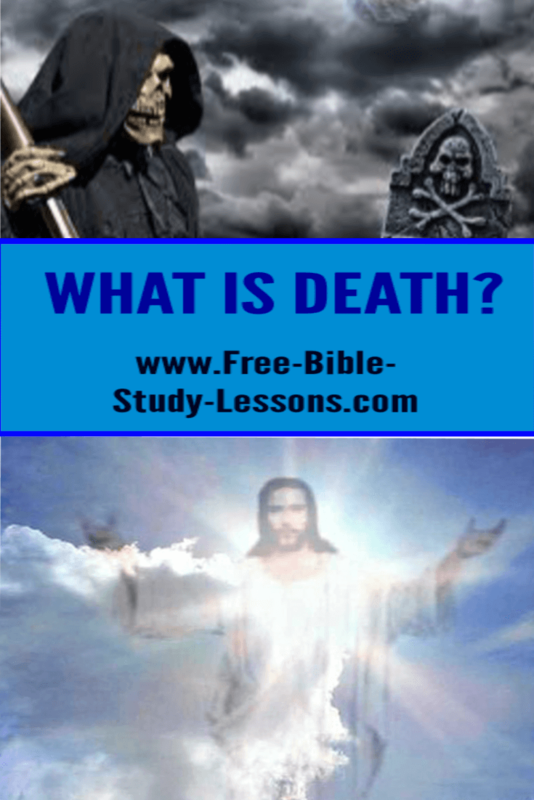 For a much deeper study, take the e-mail course, Death And Beyond. "Only 3 people were born who were not spiritually dead..."
However, when the angel told Zacharias that John the Baptist would be born, he said that "He would be filled with the Holy Spirit, even from birth "and later John, in the womb, lept when Elizabeth heard Mary's greeting - being then filled with the Holy Spirit. This doesn't sound like the baby was "spiritually dead." What do you think? 1. All have sinned and come short of the Glory of God. The only Person Who never sinned was Jesus. So with that in mind, what does it mean when it says John the Baptist was filled with the Holy Ghost from his mother’s womb? [The second reference - Luke 1:41 - states the babe leap and Elisabeth was filled...] You’re right in that it doesn’t sound like being spiritually separated from God; however, if we take the above three points as a foundation, neither can it mean that John the Baptist was saved at or before birth. In Old Testament times [and anything before the crucifixion/resurrection is under the Old Testament] the Spirit of God would come upon certain people for specific purposes. It was normally a redeemed person but not always - Balaam being a notable exception. Finally, I am only aware of this one verse that declares someone was filled with the Spirit of God from the womb. Although that verse is certainly inspired Scripture, our understanding of it has to fit with the plain teaching of Scripture elsewhere. Physical death to all creation was through ADAM & Eve's sin. Perhaps you have stated correctly that we have lived with death for so long that it "seems" natural. However, the scripture you cited, can only in a fair interpretation speak of death to mankind. (Rom. 5:12) It does appear though, that our world is designed with death as an integral part of it. Plants die to feed animals, organisms feed and depend on each other for life. There are food chains and cycles that break down previously living plants and animals into organic material from which feeds new life. Do you think that in the garden of Eden, that if Adam and Eve bit into a (permitted) fruit, and in that fruit was a worm, and they had bitten into it, would that worm have died? If an elephant stepped on an ant, would the ant die? If we allow for "plant" death, but not human or animal, if a tree died and fell over in the wind, would it kill an unsuspecting creature it fell on. Would it be possible for an animal to slip & fall from a high rocky ledge and not die when it dashed against the rocks below? When the the great blue whale injests plankton, is he not causing the death of all the life that he then digests, that existed in the huge gulp of ocean water he feeds from? Yes all things are possible with God who has created all and sustains all...but do we we have scriptural evidence for the claim that there was no death, period, in any form before the fall of man. Is this claim integral to the story of the fall of man? To begin...The Bible does not appear to consider plant “death” as an ending of life. Adam and Eve were allowed to eat fruit etc. in Eden and it was not considered the taking of life. The idea would seem to be that only beings with blood can be considered to die [Lev. 17:11, 14]. You are right that Rom. 5:12 speaks to mankind. However, man was given dominion over the animal kingdom [including fish and birds] in Gen. 1:26. As their “head,” they would be linked to his destiny. So Adam, in bringing this villain to humanity, also brought the ending of life to the animal kingdom. The situations [and thousands of others] of accidental death that you mentioned have to be considered in the overall teaching of Scripture: Death came by sin. The animal/human ending of life would have been impossible before the Fall just as it will be after the Second Coming. God’s sovereign protection would have been complete. How does this fit the animal design/food chain? The Bible doesn’t give us specific details so it moves into the realm of scientific inquiry. [answersingenesis.org and creationontheweb.org have many articles which explore these issues.] We know, for example, that bears are basically vegetarian even through they have "meat-eating teeth." Before the Fall all animals would have been vegetarian. Whether meat eating teeth, poison sacs, etc. were part of the original design or whether they mutated after the Fall scientists will have to work out. Remember, too, that the original creation could have been limited to the “head” of the “kinds” and all the varieties we have now have developed since then. Again, Creation On The Web explores these issues from a Creation/Science point-of-view. One other point to consider in regard to the animal ending of life is that if animals died before the Fall we have God declaring that animal suffering and death was a part of His “very good” creation. Also, there would then be no reason to exclude animal suffering after the Second Coming.